Feeder Dashboard is a power-up for Feeder that adds a completely new experience to consume large amounts of information in a smarter way. 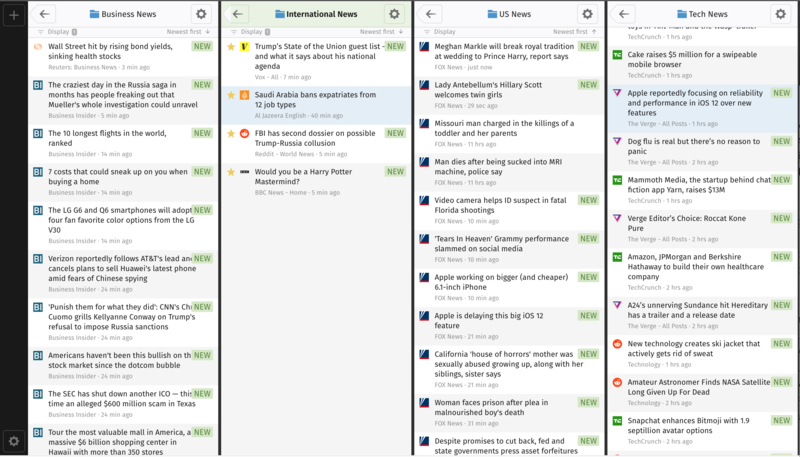 The intended use case for Feeder Dashboard is when you need a dashboard of news. It transforms a browser window into a wall of incoming data. 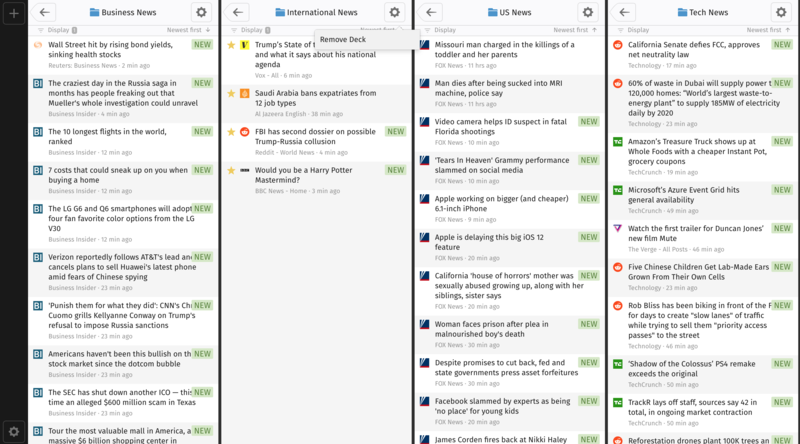 Stock traders can have a screen with the Feeder Dashboard open to follow news globally, or news agencies can have an operator monitoring a large number of news sources. With theFeeder Dashboard power-up enabled a new page is made available. On this page you can configure a set of “decks”, each containing an instance of our tried-and-true Feeder experience. Each deck is independent from another. 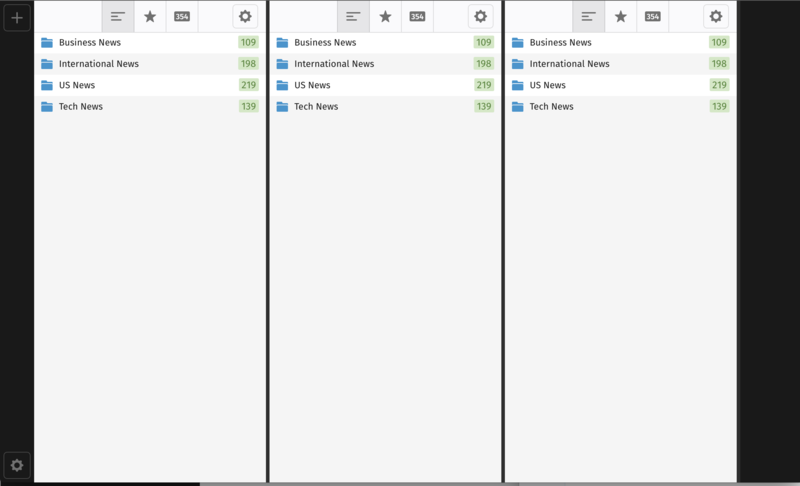 The feed or folder you navigate to is saved across reloads. The same goes for any display settings you’ve chosen. For example you can open the posts for a folder, only showing starred posts. 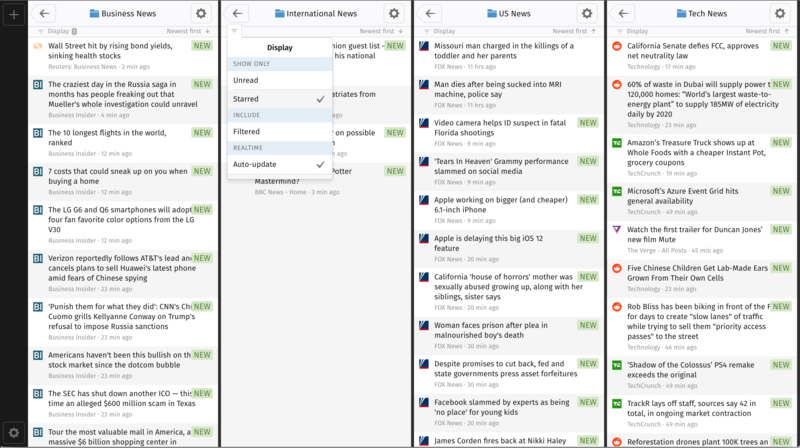 In another deck you can open the same folder and show all posts. To add a deck simply press the + button in the sidebar navigation menu. Initially a deck will inherit your global settings for sort order and display filters. To customize you simply change the filter settings as you normally would. Everything is saved instantly, so no need to change. To remove a deck press the Settings button on the top right corner of the deck you wish to remove. Each deck will store its own settings for things like sort order, which filters to use when displaying the post list (starred/unread/filtered), also which page it’s on. To start from a clean slate of settings, remove the deck and create a new one. The settings will default to your regular global defaults. To maximise the available screen space the post sidebar is not visible by default. When you click on a post the contents is loaded on top of all other content. 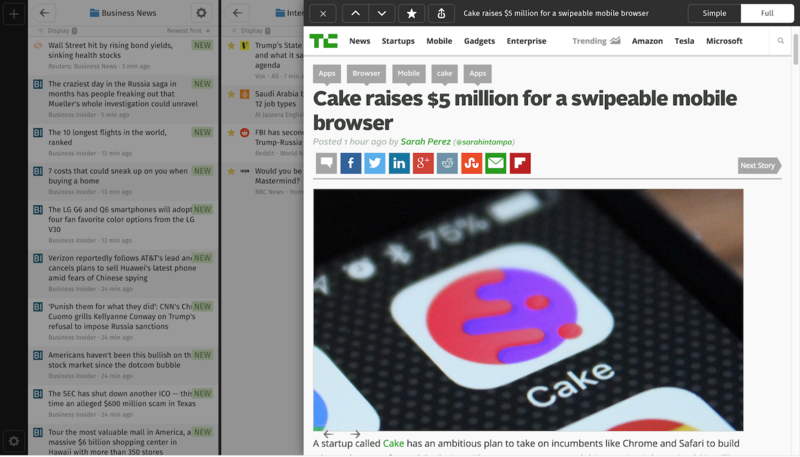 The up/down navigation arrows still work, starring the post and sharing still work as normally. Where speed is important keyboard shortcuts are a great way to be efficient. The standard keyboard shortcuts are supported by the Feeder Dashboard. Up/down to navigate (J/K as well) the post or feed list. Hit “Enter” (L also) to click on the item that is currently highlighted. To close the attached post window press “Escape”. “Backspace” (or H) also works to navigate out from a feed/folder, back in the hierarchy. To star the currently highlighted post you can press S or M. To toggle the read status on a post N or R works. To navigate between decks you use the left and right arrows on your keyboard. The active deck will get a green status bar to highlight this. The Feeder Dashboard power-up costs $50/month as an addon to your regular account. We’re eager to improve our product offering. You can always get in touch by either writing an e-mail to support@feeder.co or opening a chat window by pressing the icon in the bottom right corner of the screen at any time.